Father Patrick Lagan would struggle to say certain words out loud and his stammer got progressively worse as he grew up. 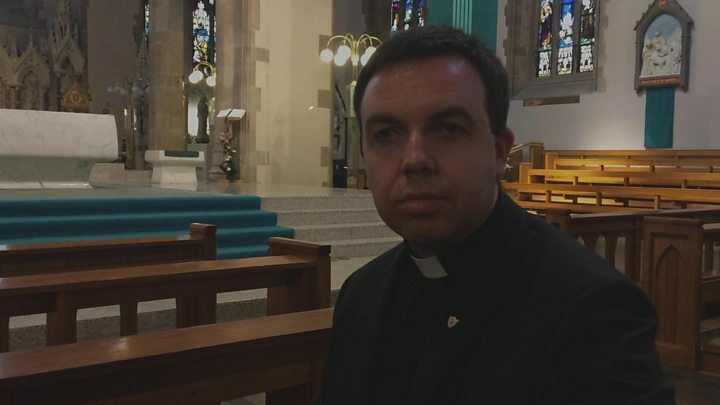 “I told myself I had a problem with my vocal chords,” the priest, who is usually based at St Eugene’s Cathedral in Londonderry, told BBC News NI. He said he stopped answering the telephone at home. “That was dangerous. You start to avoid things and that’s not good for your confidence. He later joined the McGuire Programme, which offers a method of controlling stuttering, and it changed his life “completely”. So much so, he was able to finish a reading at his leavers’ mass from St Patrick’s College in Maghera. “It was a reading from the prophet Jeremiah,” he said. “That was a big turning point for me because I finished the piece. The McGuire Programme has courses around the world. It explains to people why they have a stutter, the physiological aspect of it and how to breathe and pause in the right places. Fr Lagan said: “I learned how to accept who I was and then I started going to the classes to learn how the breathe and take my time with words. “He’s fantastic,” said Carmel Moore, from Rosemount in Derry. Peter Houston, from the Waterside, said he was “really good to talk to” and the stammer “did not hold him back at all”. “He has too many good attributes to let that hold him back in life,” he said. Fr Lagan said he knew he wanted to become a priest at a young age. “The Catholic Church was always very supportive. Certain clergymen were a great help along the way and told me to take things slowly. “There are still days where I think I could do better. I go back and practise. Sometimes I rehearse before I do weddings or funerals in the cathedral. Northern Ireland’s five health trusts have told BBC News NI that about 600 adults and children are being treated for a stammer. However, many people also seek independent care through programmes and charities. “I would advise children who have a stammer not to be afraid,” said Fr Lagan. “Those who are going through a difficult time should seek the right help. It’s not a hopeless situation.